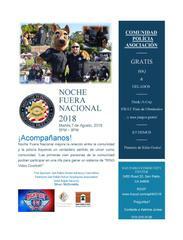 NATIONAL NIGHT OUT 2018/Tuesday, August 7th, 2018 5PM – 8PM/San Pablo Community Center - Join Us! 5PM – 8PM/San Pablo Community Center - Join Us! 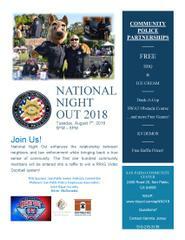 National Night Out enhances the relationship between neighbors and law enforcement while bringing back a true sense of community. The first one hundred community members will be entered into a raffle to win a RING Video Doorbell system!